The L0 Series high-speed maglev train, introduced in 2013 by the Central Japan Railway Company has broken two world records within 5 days. On 16 April 2015 it reached a maximum speed of 590 km/h (367 mph) on the 42.8 km (26.6 mi) long Yamanashi Test Track near Mount Fuji. A few days later on 21 April they took it even further and reached 603 km/h (375 mph) top speed. The L0 Series train carrying 49 Central Japan Railway employees spent 10.8 seconds traveling above 600 km/h, during which it covered 1.8 kilometers (1.1 miles). In comparison the current fastest commercially operated train is the Shanghai Maglev in China, which has a top speed of 431 km/h (268 mph) and runs from the airport to the city. Japan Railway Company has been testing the L0 maglev train to see what would be the best operational speed for a planned route between Tokyo and Nagoya, that is planned to be in service by 2027. 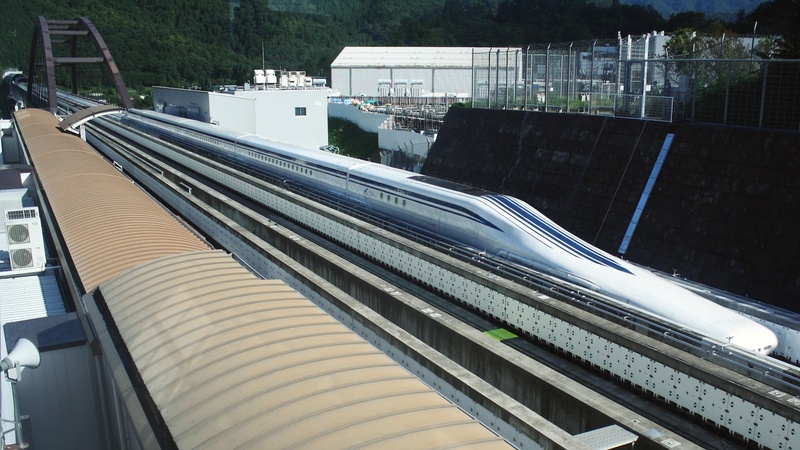 This trip would take you around 5 hours by car, but the L0 maglev would be able to do it in under 40 minutes. The plan for 2045 is to reach Osaka in 1 hour 7 minutes on the same line.